The best way to cook vegetables is to bake them. Boiling is good if every water is used and none of the liquid is thrown away. Waterless cooking, casserole baking, and low-pressure steam cooking are also good. 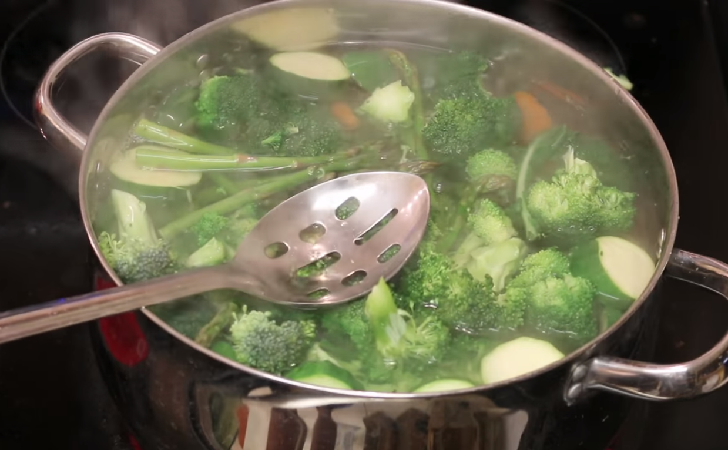 When boiling vegetables, put them in just enough boiling water to cook them and don’t overcook them. If there is any water left, save it to add to your soups or broths. The vegetable must boil or simmer continuously after placing them in the water; otherwise, they will become water-soaked. Add sea salt sparingly just before the vegetables are entirely done; if salt is added as they are beginning to cook, it has a tendency to toughen them. Cook vegetables only until they are tender; prolonged cooking destroys the life-giving properties. Do not add fat to the vegetables while they are cooking; add your seasoning just before they are done, and serve them at once. Never peel or remove the eyes of Irish potatoes before cooking; the life of the potato is in the eyes and the peel. Do not peel any vegetable that can be used without peeling. Carrots, parsnips, salsify (vegetable oyster or oyster plant), rutabagas, and others may be scraped lightly, so as not to lose the minerals that are found just under their skins. Green vegetables are very desirable during the winter months; if you think them expensive remember that they are far cheaper than the cost of an illness, and when properly prepared they are real medicine. Canned or frozen vegetables, even if you get a good brand, are not as good as properly prepared fresh vegetables. But they are better than fresh vegetables that are poorly prepared. To obtain the protein with your vegetables, serve one of the many new meat analogs now on the market, or any nuts you like best. Nuts require thorough mastication, however, and they should be chewed to a creamy consistency in order to get the best out of them. The meat substitutes that contain nuts are better for most people because the nuts used in them have been ground. Vegetables can be seasoned with soy mayonnaise that has been made without the lemon if desired. Either dilute the mayonnaise with cold water to the consistency of cream or use it as is. Either rich soybean milk or one of the nut milk is good when added to hot vegetables; heat the vegetables for only a few minutes after the milk has been added, and serve at once. Good soybean milk can now be purchased; thus you can always have it on hand. All the non-starchy vegetables, such as carrots, cabbage, cucumber, radishes, and parsley, should be eaten raw if they agree with you.